Overview - The Canadian Malting Barley Technical Centre (CMBTC) is an independent, not-for-profit research facility established in 2000 that serves the Canadian malting barley value chain providing technical support and market information to stakeholders including breeders, producers, seed companies, processors, exporters, maltsters and brewers. 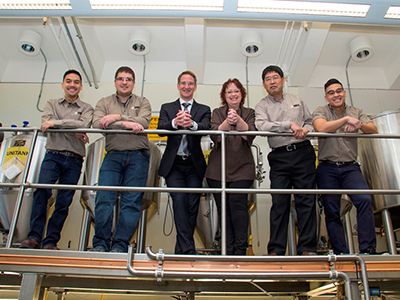 State-of-the-Art pilot malting and brewing facilities, staffed with specialists, are used to evaluate the quality of Canadian malting barley in the malting and brewing processes, simulating commercial scale production. The CMBTC delivers solutions to the malting barley, malt and brewing industries through a variety of activities including quality evaluation of new Canadian malting barley varieties, annual new crop quality assessment, export cargo analysis, troubleshooting and technical support for members as well as market development initiatives. The CMBTC offers technical expertise to accompany the marketing and commercialization of Canadian malting barley and malt to help differentiate Canada from other suppliers. Membership and Funding - The CMBTC is a membership based organization. Our 25 members are comprised of players along the value chain including breeders, producer associations, provincial governments, seed distributors, line companies, malting companies, breweries and exporters (see below). Funding for the CMBTC is provided through memberships as well as contributions from producers, through the Western Wheat and Barley Checkoff program and the Government of Canada. Current CMBTC Members: ADM Agri-Industries, Alberta Barley, Alberta Agriculture, Canadian Grain Commission, CANTERRA SEEDS, FP Genetics, G3 Canada Limited, Hailar MDL Beer Materials, Integrated Grain, Manitoba Agriculture, Manitoba Liquor & Lotteries, MolsonCoors, New Glarus Brewing, Prairie Malt-Cargill, Public Barley Breeders, Richardson International, SeCan, Syngenta, Tsingtao Brewery, Saskatchewan Ministry of Agriculture, Saskatchewan Barley Development Commission, Shandong Hylaine Malting, Viterra.